Water has been discovered on Mars- could lifeforms be next? 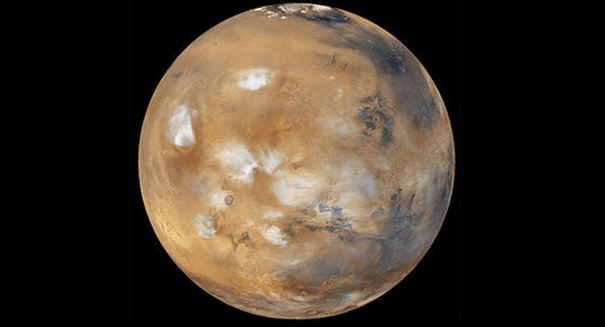 Data from a NASA spacecraft has revealed that there is in fact water on Mars. The world of science is once again pondering: could there be life on the distant red planet? “It suggests that it would be possible for life to be on Mars today,” said John Grunsfeld, NASA’s associate administrator for science. The source of the water is not currently known nor is the water’s chemistry. However, the briny water does seem to only flow during the summer months. Scientist were able to discover the flows thanks to a new technique that allows NASA’s Mars Reconnaissance Orbiter spacecraft to create a chemical map of the planet’s surface. After a lengthy examination, they found signs of salt formations that only ever form in the presence water. Throughout Mar’s equatorial zone, narrow channels cut into cliff walls, leaving behind a salty residue. It was only by taking measurements at the hottest part of the Martian day that the Mars Reconnaissance Orbiter was able to detect the hydrated minerals. Any traces of water are thought to have evaporated. “Mars is not the dry, arid planet that we thought of in the past. Under certain circumstances, liquid water has been found on Mars,” said Jim Green, the NASA’s director of planetary science. Yet, just because water has been discovered, it in no way of shows if life forms use this water source (assuming there is life on Mars). “If I were a microbe on Mars, I would probably not live near one of these (sites). I would want to live further north or south, quite far under the surface and where there’s more of a freshwater glacier. We only suspect those places exist and we have some scientific evidence that they do,” said Grunsfeld. What is still unknown is if the water bubbles up from beneath the surface or comes directly from Mars’ atmosphere. Regardless, the prospect of water, no matter how briny or chemically polluted, will certainly effect missions to Mars. Currently, NASA hopes to land astronauts on the surface by the mid-2030s. Scientists are now trying to piece together the history of a planet so similar to ours yet seemingly so barren and lifeless. This most recent discover provides an important clue to answering the riddle. NASA’s findings were published Monday in Natural Geoscience.